What is sectional warping and what are some reasons to do it? When I started handweaving, I found warping the most difficult and slowest step, like many people. After all, lengths of hundreds of threads, in order, under perfect tension, packed onto the beam for weaving sounds a bit overwhelming when you put it that way! When I switched to sectional warping, it was a game changer. Both my floor looms are now sectional – one has two beams, both sectional – and I’m even going to convert my table loom! But first, what is sectional warping? Well, to warp plain beam, we make the entire warp, probably in chains of various sizes, and feed the entire width onto the loom at the same time. There are different methods to do this, the two general ways being front to back and back to front. I’ll leave that for now because I want to focus on why I love sectional warping! Sectional warping is dividing the warp beam into much smaller, even sections, and warping one at a time, like lots of tiny warps. So what have I found are the benefits to sectional warping using a sectional beam? Speed – I find that I can beam a single section at lightning speed. I recently did a 20m+ 60/2nm silk warp, which is a lot of ends, and made and warped each 2″ section in under 30 min. I did 15 sections, and there is no way I could have warped yarn that fine and got it on the beam in that period total with a plain beam. Depending on your tools, you also may not have to make chains at all, further speeding up the process. Interruption-friendly – I have kids. And cats. And a short attention span. Working with a plain beam I either need to smash through the whole thing at once, or risk it being mauled. With a sectional beam the time investment to get a section done and safely out of the way of disaster is much smaller. No cross – Or at least I’ve never used one with a sectional beam, and I don’t know many people who do. It’s not necessarily neccessary, just make the chain and off you go. People always ask, but what about tartan! Yes, done that too and didn’t use a cross – I beam it in the right order and then control exact colour order in threading. Less fiddling makes it go faster for me. Visual – If a section is wonky or larger than the rest, you can usually see it and can chain off that just section to re-beam it without affecting the rest. With plain beam you’d have to take off the entire warp. Length – This works fantastically for long warps and can in theory increase dramatically how long your warps can be, if you’re into that. On the other hand, people successfully plain beam enormous warps. For me, realistically, I can’t do huge warps plain beamed, whereas I feel confident that I’ll never even approach the upper limit of what I could sectionally beam confidently. Expense– You need extra equpment. You’ll need a sectional beam, for starters, and either a tool or machine to make sections (more on this another day), or a spool rack and bobbins, possibly a tension box. Possibly more. I found it paid itself off almost instantly because of the sheer amount of time I saved, but the outlay can be significant. However, there are definitely DIY options! Speed – I said above that I find it much faster to warp sectionally and I believe most weavers do who use it, but I do know a couple weavers who switched to sectional and then switched back because they prefer to beam the entire warp at once via plain beam! We all have complex reasons to prefer what we do, so there’s never a guarantee. 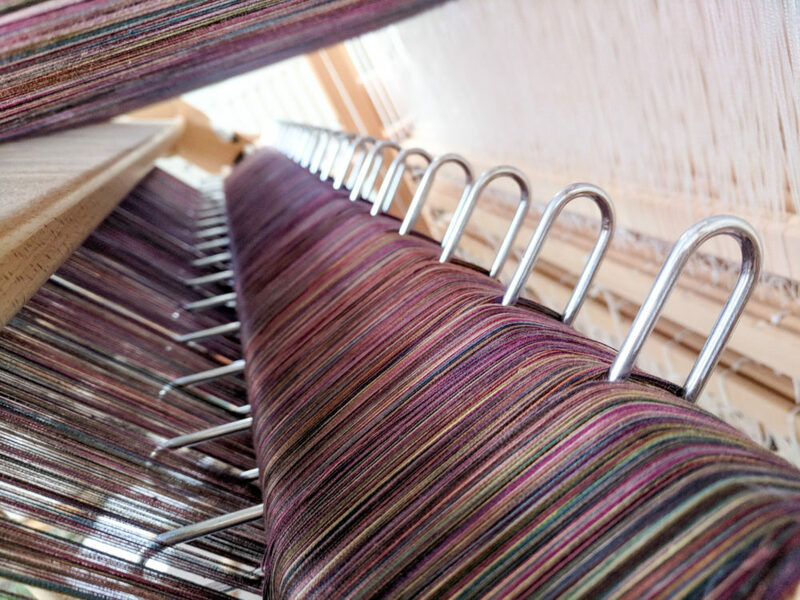 Consistency – Instead of beaming one warp, you’re beaming multiple tiny ones. Realistically, to me, it’s still miles easier, but I can definitely see how some people find that a more daunting task! So you do not by any means need to do sectional warping on your floor loom. But I’ve found it dramatically faster, easier to get through, easier to get a great warp every time, and easier to fit in with real life. I hope this has some info that helps! If it does, please feel free to share on Facebook / Instagram / Pinterest. The warp in this picture is my handpainted ‘Ephemeral’ warp in 60/2nm silk.